← Create Your Own Valentines at the National Postal Museum this Weekend! Washington, DC, is a pretty cool city to view from high up. 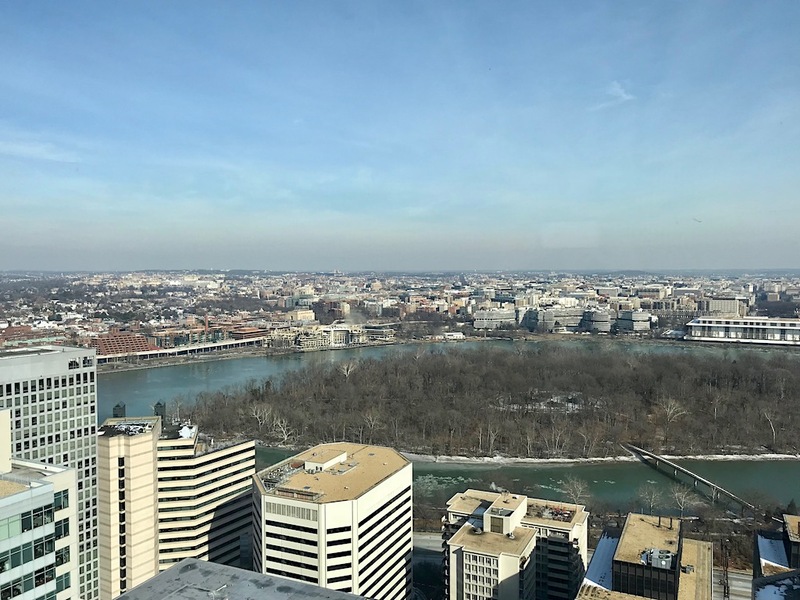 Unfortunately, due to building height regulations that limit structures to about 13 stories high, there are very few places in the District that offer a good bird’s eye perspective of the area. 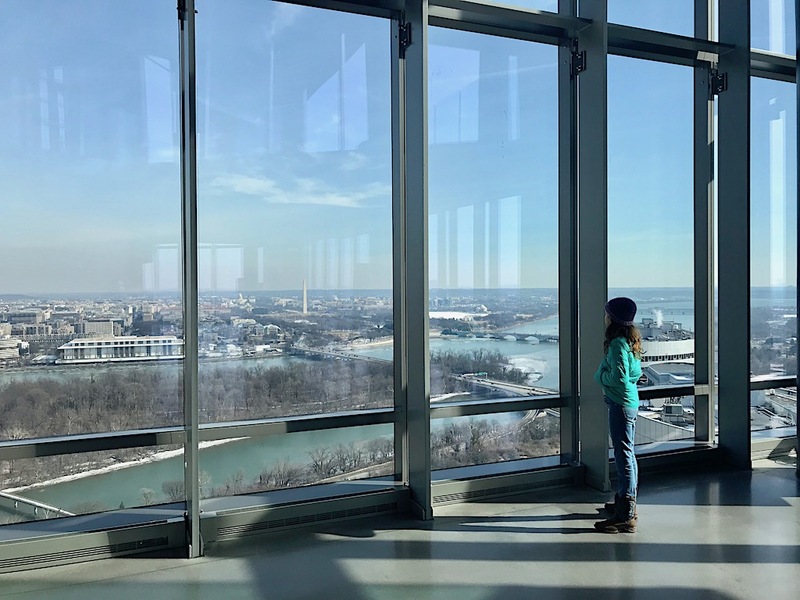 But, now, just across the river in Northern Virginia you can enjoy incredible, sweeping vistas of DC and VA — and then some. 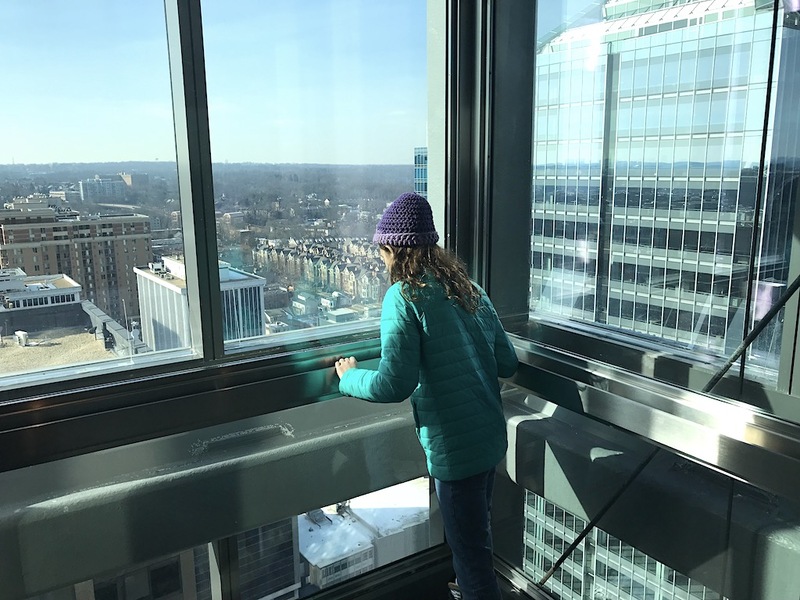 The Observation Deck at CEB Tower in Rosslyn was designed just for this purpose. 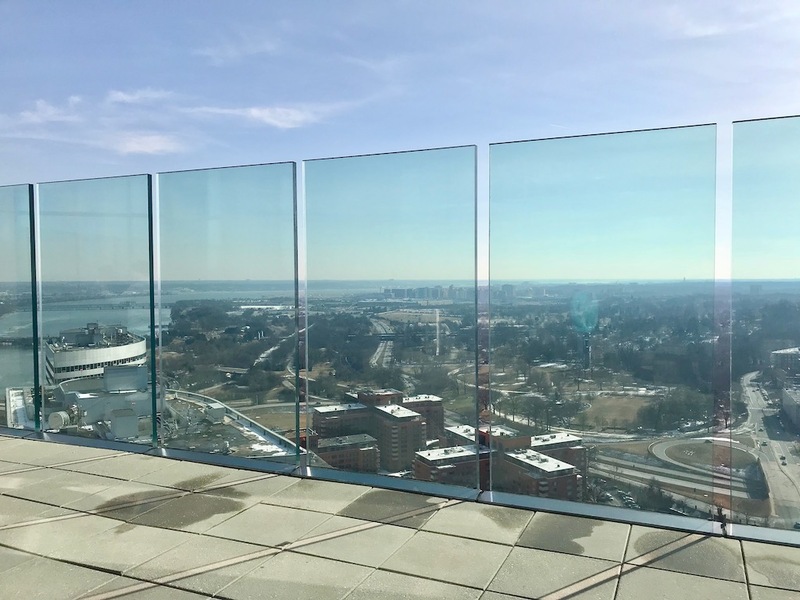 The 12,000-square-foot space on the 31st and 32nd floors of the building offers 360° panoramas of the capital region. 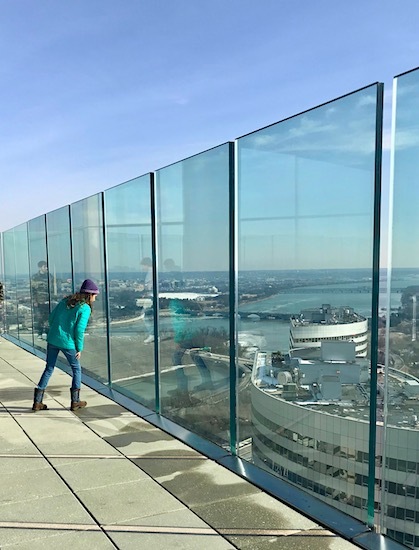 The Observation Deck opened last June, but without very much buzz (that I’d heard, anyway). So, it wasn’t until this past weekend that I finally checked it out with Sasha after seeing a great Certifikid deal on admission. It wasn’t just the discount that reeled me in, though. It sounded like a really neat experience, kind of like flying into or out of DCA when the wind is in your favor, you’ve got a window seat on the right side of the plane, and you can gaze upon the memorials, the green stretch of National Mall, and the flowing rivers below. But even better here, we could take it all in for as long as we wanted, not just the fleeting seconds it takes soar over it. Our adventure at CEB Tower actually began in the elevator. 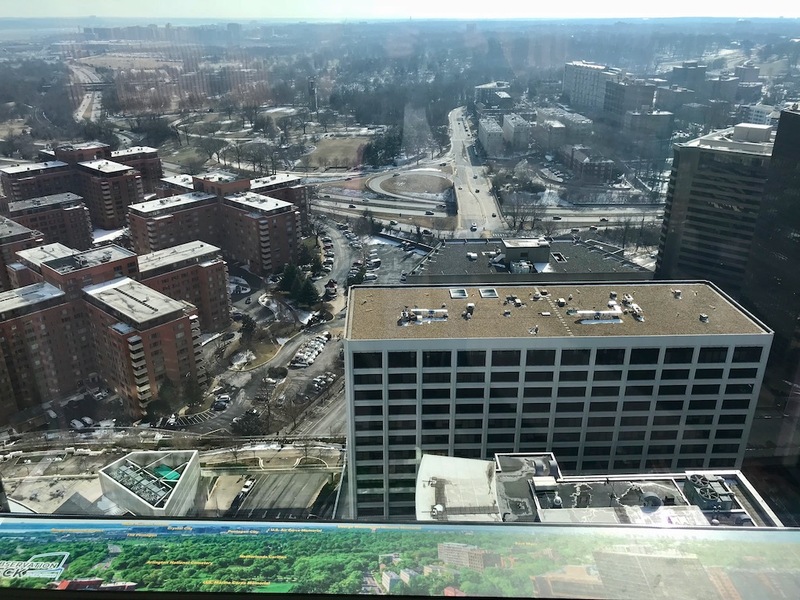 With glass on two sides, we watched the bustling streets of Rosslyn retreat below us and got a glimpse of Georgetown and Northern Virginia in the distance as we zipped up 30-plus floors. I have to admit it gave me a bit of jelly knees, but it also made us excited for what was to come — which was awesome. 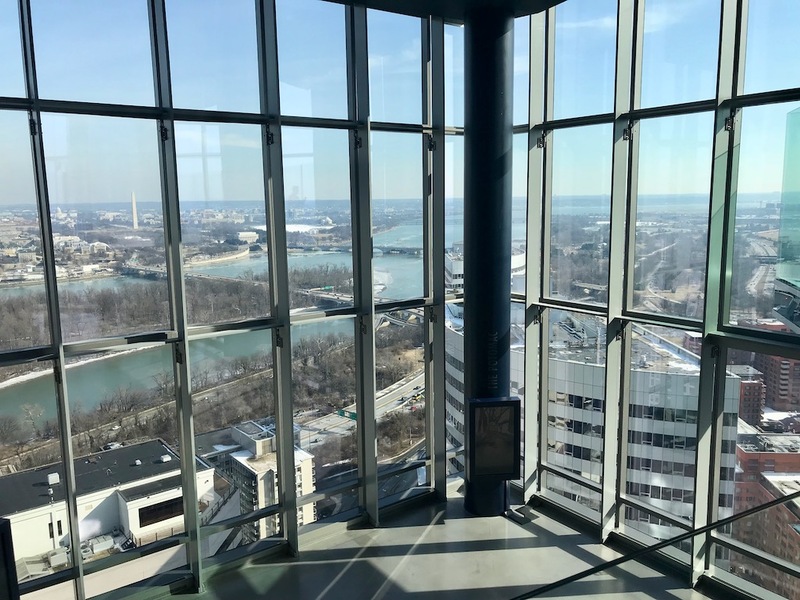 Walking out of the elevator, the spacious room with floor-to-ceiling windows, sunlight spilling through them, and long shadows streaking across the floor was a sight in itself. 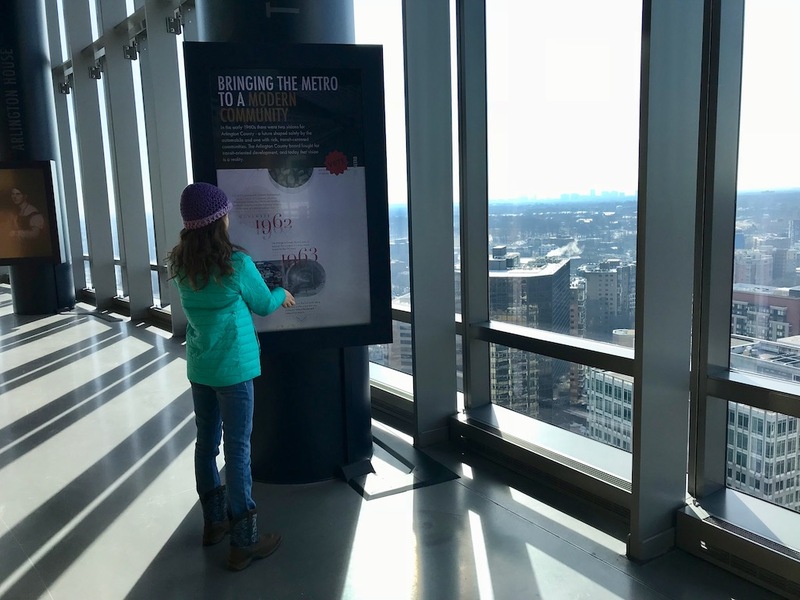 We were greeted by friendly staff who got us oriented by pointing out a water tower in the distance near the CIA Headquarters in Langley, explained how the interactive displays worked, and generally gave us the lay of the land, both in the tower and the landscape around it. Sasha and I first approached the windows carefully — it’s very high up! — but once we were comfortable, we started making our way around the circular space. The views really are incredible. We could see for miles, and it was fun to pick out major landmarks, try to find our house (or the general area), and see some of the places we frequent regularly from that vantage point. 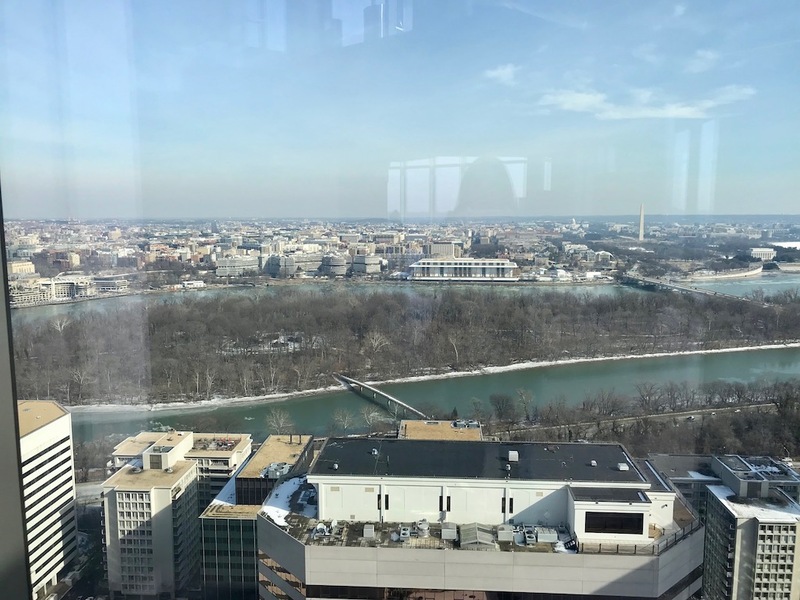 I loved seeing how the Potomac meandered through the scene and the shape of Roosevelt Island. And the Washington Monument with the Kennedy Center in the foreground and U.S. Capitol beyond it was a sight we lingered on for awhile. 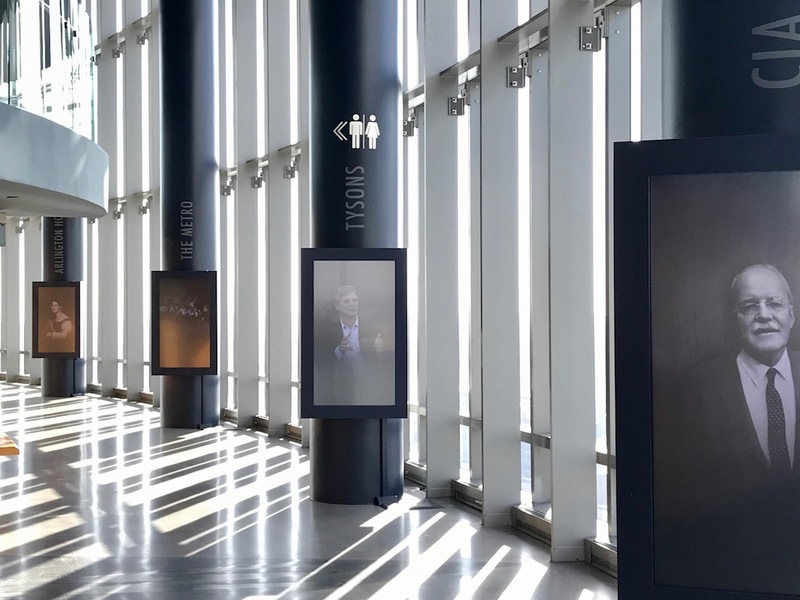 Interactive digital kiosks placed next to the windows offer an in depth look at what you see beyond them. 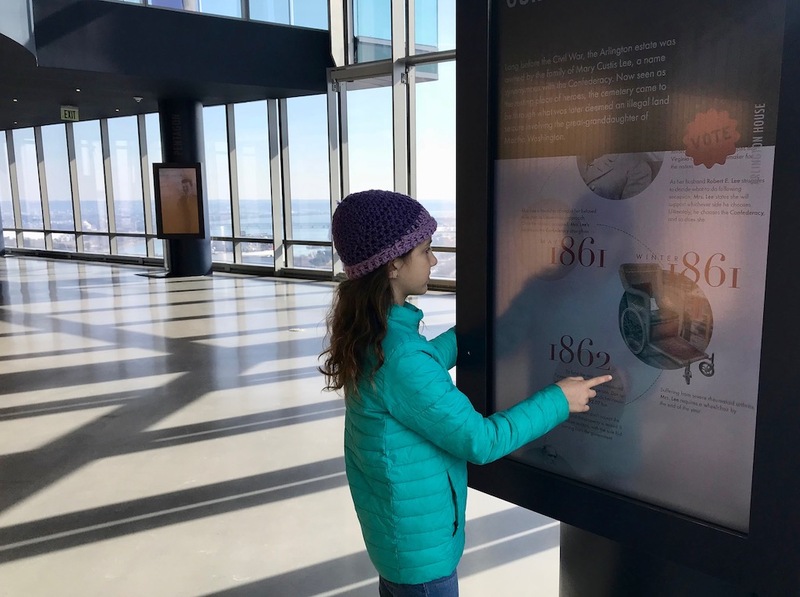 We scrolled through timelines depicting the development of places, learned about people connected to them, and pondered various issues of historic times and now. A fun and interesting element of the displays was the chance to cast votes on different issues that were later tallied for a “Collective Perspectives” display. Another interactive element is HoverDC, an immersive adventure that “flies” you through restricted airspace over the nation’s capital, offering 10,000-foot high views of iconic landmarks like the Jefferson Memorial, breathtaking nature like Great Falls, and concealed places like the courtyard within the Pentagon. 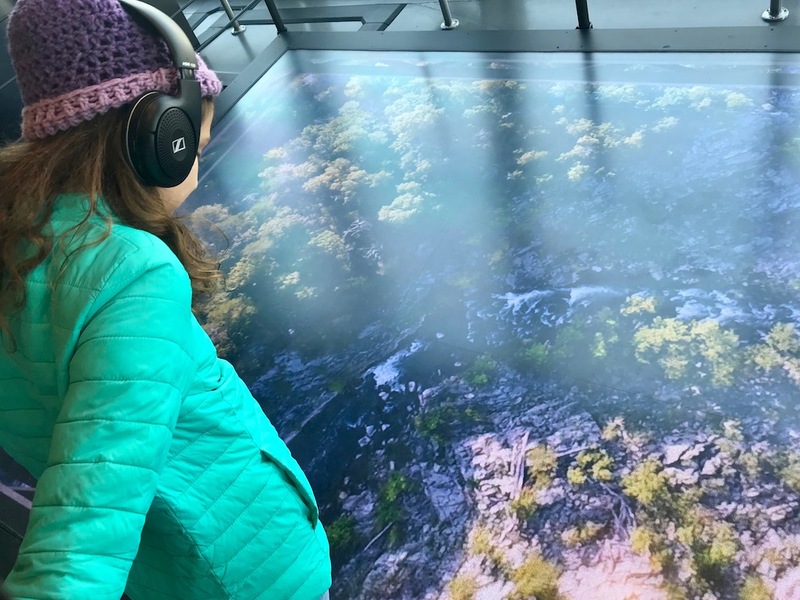 Essentially, you’re standing on the edge of a large screen as video plays at your feet, “wind” blows in your face, and you listen to the captain talk about the sights below through headphones. There is also a champagne bar on the upper level, as well as small cafe/bar on the main concourse below. 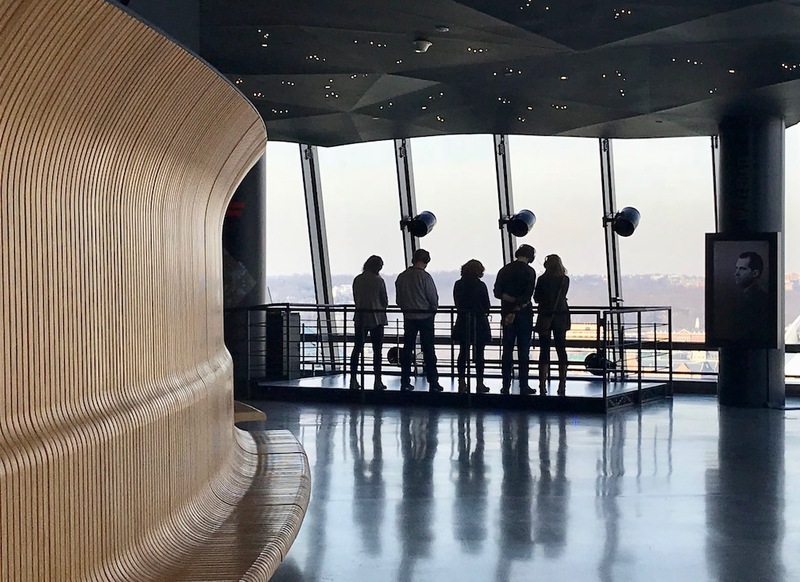 It would be great to take advantage of them on an evening out — and enjoy what are surely stunning views of the skyline at night. 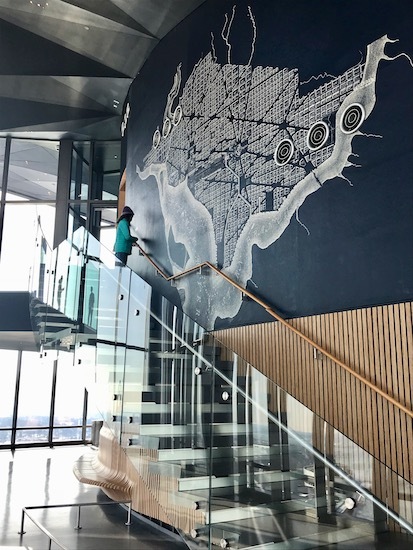 The Observation Deck at CEB Tower is located 1201 Wilson Boulevard in Rosslyn (the official address is Arlington, VA). The box office is located at Central Place Plaza, on the 1700 block of North Moore Street, across from the Rosslyn Metro Station. Tickets purchased online are $21/adult, $11/age 5-13, $16/seniors & military, free for children under 5 (they are $1 more at the box office). Be sure to check CertifiKid for a discount. And if you live in Arlington, put away your wallet — residents get in FREE! Hours are 10am – 8pm Monday – Friday, and 9am – 8pm Saturday – Sunday. Thanks for posting! I’d been contemplating going since I heard it was free to Arlington residents, but your pix just convinced me! Question: I know that for adults you can just show a driver’s license to prove Arlington residency, but did you have to show anything for your child, or do they just take your word for it? I’m not an Arlington resident, so I don’t know for sure. But I’d assume they’d take the parent’s word for it. And I should note that my photos don’t do it justice — the views and the whole experience inside are really great! This past Tuesday, I was at this location on the 30th floor at “Convene” for a work conference. When I say the views are just indescribable – OMG. My co-workers and I couldn’t stop gazing outside the window. I couldn’t wait for lunch break to gaze out at the city view again. Not to mention, it happened to be a comfortable 65 degrees that day. I can’t wait to go to the Observation Deck!